It’s often said that every relationship needs trust, commitment and open channels of communication. But let’s face it, the relationship between IT and the business has often been one of mistrust, opportunism, mutual misunderstanding and general dysfunction. 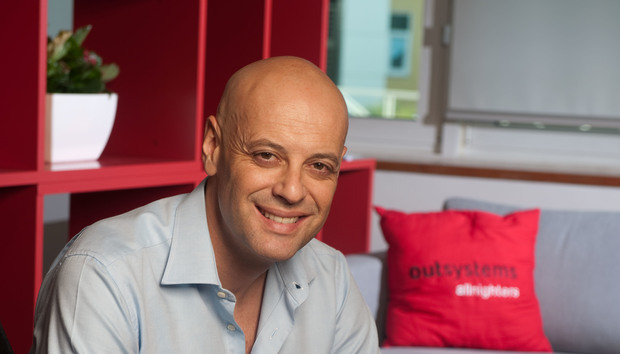 OutSystems is a Portuguese company that is trying to bring harmony from that world of strife via a visual platform for building enterprise web and mobile apps. It provides a choice of stacks and languages together with model-driven code generation, reusable components and tools that track dependencies and impact analysis. Buyers pay annual subscriptions based on criteria such as volume of objects or number of logged-in users. “It’s not that IT is full of dumb people, it’s the fundamental nature of software development [that causes fissures between IT and the rest of the business],” says CEO Paulo Rosado when we meet in his company’s London offices. Projects are agreed on but they creep and “the next change becomes more difficult” because of the knock-on dependencies and rethinking needed. Rosado describes OutSystems as providing “a platform for fast, robust change, leading to disruption in the way IT answers to business.” The business is never going to stop going back to IT with new requests once a project has commenced, he argues, and that back-and-forth process can only be supported with a platform that supports iterative development rather than fighting against it. But, I ask, isn’t this approach a head-in-the-sand approach that bows down before bad processes? Rosado thinks not because, even in an organisation that has a strong IT-business relationship, change occurs. But won’t the cloud automatically address a lot of the problems here by providing limited configurability? For Rosado, software as a service is “now best practice” but he insists that customisation of, say, SAP systems will go on for years and decades. Also, cloud is fostering a new issue: Shadow IT, where business departments do their own thing by purchasing without involving IT, leading to potential trouble further down the road. Rosado see OutSystems as a way to clean up the backlog of change requests and create a better modus operandi. The platform cuts time and number of people needed and Rosado reckons that 20 months projects can be reduced to 5 months and a team of 30 reduced to 10. It’s a proposition that has seen the company pick up 300 customers in 22 countries with momentum building in Brazil, APAC and the US. R&D is centred in Lisbon. He says his case is helped by the general trend towards Agile development. Customers are becoming evangelists for the company. Chris Platt, systems development manager at broadband service provider Zen Internet, is a supporter. Zen now uses OutSystems across its development processes and although the platform is no panacea (he’d like better integration with web services, for example) Platt is impressed. What next? Rosado says that at some point the platform will be available on Amazon Web Services and/or Windows Azure.